We went into 2016 with a few sustainability goals and high hopes of achieving them. If we weren’t going to get there, we were sure going to work hard trying. Each year we learn more about what we can do as a company, and more about the intricacies of our goals, terms, and how regulations can play into our end game for sustainability at Swamp Head. Offset the carbon footprint of our brewery’s tasting room, The Wetlands. Plant over 50,000 trees in Alachua County. Bring attention to important environmental issues facing our state, and begin to do something about them. 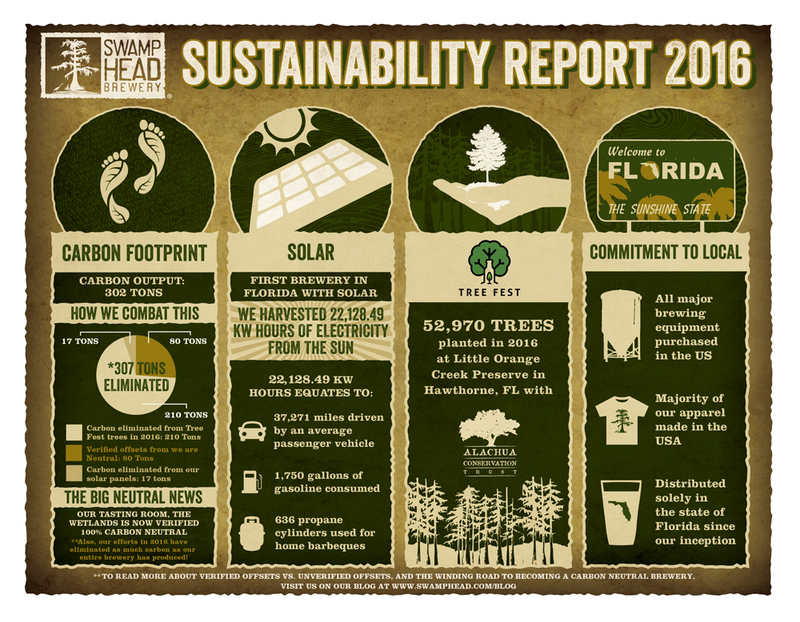 Goal #1: Offset the carbon footprint of our tasting room. Did we get there? Oh yeah, we got there. Thanks to some help form our carbon neutrality partners, We are Neutral, we were able to acquire enough verified (more on this later) carbon offsets to make our tasting room, The Wetlands, 100% carbon neutral! Fun fact: A portion of these offsets were made possible by a donation from our FL/GA collaboration “Backyard Brawl” brewed in conjunction with Terrapin and Intuition Ale Works. So, the next time you’re having a beer in our tasting room, know that you are doing so in a business that is 100% Carbon Neutral. We’re pretty proud of that. Our long-term goal is to offset the carbon footprint for our entire brewery, but this will take time. The way we have decided to get there is by setting yearly goals that are lofty, yet attainable, and slowly move toward 100% carbon neutrality. Goal #2: Plant over 50,000 trees in Alachua County. Did we get there? You bet your dibble we did. Thanks to our awesome sponsors and our conscientious community, we were able to plant over 50,000 trees with the Alachua Conservation Trust. These trees were able to be planted thanks to our annual event, Tree Fest, which takes place at the brewery around Earth Day and Arbor Day each year. The event is co-hosted by our solar partners, Solar Impact of Florida, and is a full day of family-friendly activities paired with fundraising for tree planting. Fun fact: The trees are planted at the Little Orange Creek Preserve in Hawthorne, FL. This year, Swamp Head and Solar Impact were able to attend a tree planting event and put a few thousand of these trees in the ground ourselves! Fun fact #2: The number of trees that we have planted in Alachua County thus far will consume far more carbon dioxide needed to “offset” the carbon footprint of the entire brewery. However, due to the fact that the longleaf pines that we plant here in Alachua County are not “verified offsets,” we can not officially count them toward our carbon offset goals. Goal #3: Bring attention to important environmental issues facing our state, and begin to do something about them. Did we get there? 2016 was the year to get the ball rolling on some really big things. Thanks to some amazing partnerships that we’ve developed over the last 9 years of brewing, we have been able to get the attention of the folks fighting the good fight for issues that we feel are of utmost importance to the state of Florida. We expanded the production of Eternal Blonde Ale, a benefit beer for the Florida Springs Institute, and put the wheels in motion for a year-long coastal cleanup event with the Coastal Conservation Association, the Trash Tour. Eternal Blonde Ale: Now brewed with Florida spring water, this blonde ale was created to give some attention to the issues facing Florida’s waters, especially the springs. A portion of proceeds of this beer go directly to FSI, and we host a number of events at the brewery with them to get the word out about everything springs related. Trash Tour: In 2016 we began the planning of an event that would launch in 2017 focusing on cleaning up Florida’s coasts. Since March of this year, we have successfully completed two of five trash clean-up events, travelling all around the state cleaning up thousands of pounds of trash from the beaches and waterways of Florida. You can see more information about these events, here and here.